A collusion exists between the anti-Semitic, White supremacist forces that have ascended to the White House and Zionists. While the former advocate for global apartheid and a race battle between Europeans/Whites/Western “values” and an imaginary construct of dark-skinned barbaric hordes, the latter promote a Jewish-only settler-colonialist “villa in the jungle” as an anti-Muslim, Western stronghold and a means to salvation in the form of the second coming (Christian Zionists) or the construction of the third temple (Jewish Zionists). This relationship contains a glaring paradox: anti-Semitism is a central tenant of White supremacy, neo-Nazism and the “alt-right” just as much, if not more than, anti-Muslim sentiment. There is a long history of collaboration between anti-Semitic forces and Zionists. Anti-Semites aim to get rid of Jews and all “other” races, while Zionists have worked to entice Jews, by any means necessary, to Israel’s shores, i.e. Judaizing Israel as a means to fight the “demographic threat” posed by native Palestinians. This collaboration has recently culminated in a grotesque display of brotherly love between Israeli Prime Minister Benjamin Netanyahu and the President of the United States Donald Trump. Immediately following Trump’s surprising victory, Netanyahu, the self-anointed representative of world Jewry, praised Trump for his friendship and support of the state of Israel, as exemplified by his campaign rhetoric. In their first joint press conference, which included reciprocal ego-stroking, Netanyahu clearly defined the currently convenient mutual interest that binds modern day Israel and Zionists with Trump and his anti-Semitic enablers: radical Islamic terrorism. However, since the American elections there have been a series of anti-Semitic bomb threats and desecrations of Jewish cemeteries that are unrelated to Islamic terrorism. 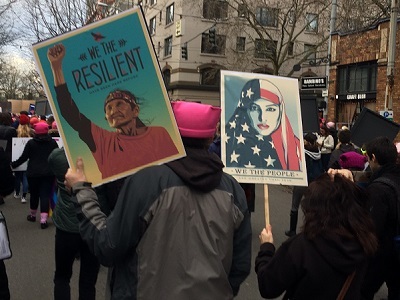 In fact, these add to a growing number of racist expressions against immigrants, Muslims, LGBTQI and other members of minority communities, apparently fueled by the emboldening of racist groups and individuals inspired by Trump’s ascendency. 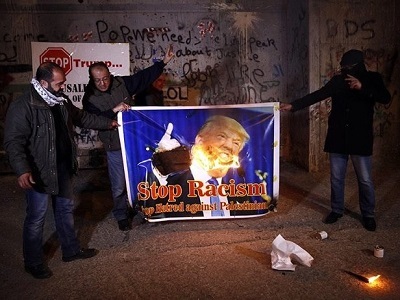 In response to these incidents , Trump ignored his obvious culpability in this spike of violence and regressed to anti-Semitic rhetoric, claiming that the desecrations and attacks could be false flags perpetuated by Jews themselves. Furthermore, when directly asked by a reporter about the spike in anti-Semitism, Trump referenced Netanyahu’s support as a sort of vindication. In this context, Netanyahu and his ilk are directly aiding and abetting anti-Semites. It is painfully ironic to recall the words of the newly-confirmed Israeli ambassador David Friedman, who accused members of the liberal Zionist group J Street of being “far worse than kapos”. Friedman has been serving Trump’s agenda in one capacity or another for years. Trump’s particular claim underlines a nexus where anti-Zionists and anti-Semites sometimes converge and is a dangerous trap for Palestine advocates. Claims that dismiss an anti-Semitic and racist reality, such as those vocalized by Trump and supposedly backed by anecdotes of Jews involved in hate crimes, serve to validate notions of a Zionist conspiracy that foments anti-Semitism for the purpose of Jewish immigration (Aliyah) to Israel. Whereas fear has undoubtedly been used by Zionist propaganda (Hasbara) to promote Aliyah, it is erroneous to associate all, or even most expressions of anti-Semitism with this phenomenon. In fact, it is extremely counterproductive for Palestinian advocates to promote such claims as it serves to excuse the real culprits who are frequently White supremacists and anti-Muslim, and associates the Palestinian cause with right-wing anti-Semites. Instead of falling into this trap, Palestinian advocates and members of the Boycott Divestment and Sanctions movement would do well to continue to focus on forming allegiances with progressive and radical groups who represent other victimized minority communities with goals of equality and justice, such as the Black Lives Matter movement and others. The recent wave of Trump-inspired violence and bigotry inflicted on both Jewish and Muslim American communities has presented opportunities for building bridges of interfaith solidarity that have proved highly successful (see here and here). Collaboration between repressed communities may be the best and only hope of fighting the divisiveness and ongoing cycle of violence and inequality, which plagues societies in America and Israel/Palestine.